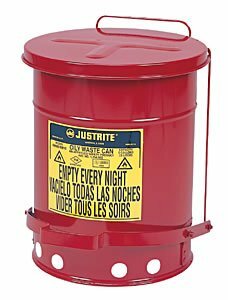 The Justrite galvanized steel oily waste safety can has a foot-operated, self-closing lid and a ventilated bottom for disposal of fabrics soaked with solvents, thinners, and other flammable liquids. The self-closing lid opens no more than 60 degrees and closes tightly to restrict oxygen flow inside the can, helping to prevent spontaneous combustion of flammable waste. The can's round shape and ventilated, elevated bottom allows air to circulate around the can to disperse heat, and minimize moisture build-up and rust.